A negative Amplitude parameter value causes a 180-degree phase shift. You can generate a phase-shifted wave at other than 180 degrees in many ways. For example, you can connect a Clock block signal to a MATLAB Function block and write the equation for the specific wave. You can vary the output settings of the Signal Generator block while a simulation is in progress to determine quickly the response of a system to different types of inputs. The Amplitude and Frequency parameters determine the amplitude and frequency of the output signal. The parameters must be of the same dimensions after scalar expansion. If you clear the Interpret vector parameters as 1-D check box, the block outputs a signal of the same dimensions as the Amplitude and Frequency parameters (after scalar expansion). If you select the Interpret vector parameters as 1-D check box, the block outputs a vector (1-D) signal if the Amplitude and Frequency parameters are row or column vectors, that is, single-row or column 2-D arrays. Otherwise, the block outputs a signal of the same dimensions as the parameters. 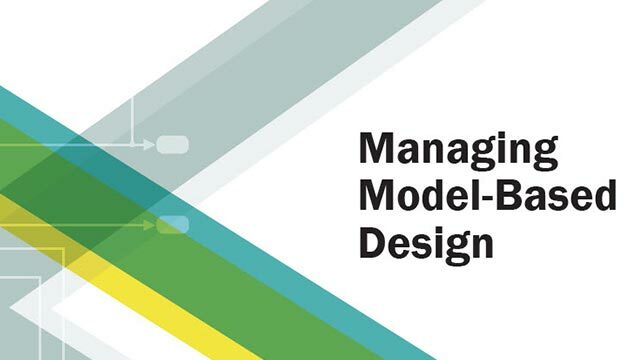 If your model uses a fixed-step solver, Simulink® uses the same step size for the entire simulation. 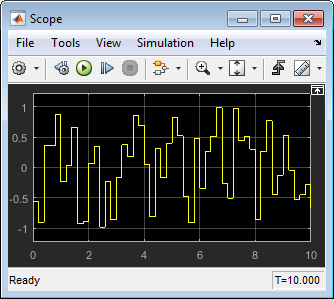 In this case, the Signal Generator block output provides a uniformly sampled representation of the ideal waveform. 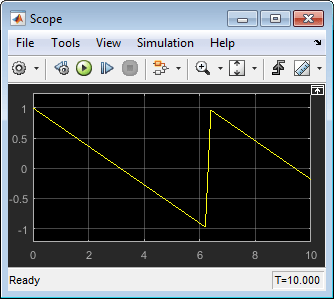 If your model uses a variable-step solver, Simulink might use different step sizes during the simulation. In this case, the Signal Generator block output does not always provide a uniformly sampled representation of the ideal waveform. To ensure that the block output is a uniformly sampled representation, add a Hit Crossing block directly downstream of the Signal Generator block. These models show the difference in Signal Generator block output with and without the Hit Crossing block. Output signal specified as one of these waveforms. 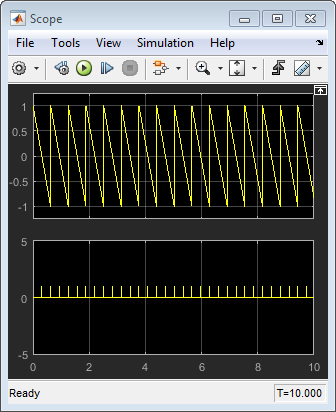 Specify whether to use simulation time or an external signal as the source of values for the waveform time variable. If you specify an external source, the block displays an input port for connecting the source. Specify the amplitude of the generated waveform. 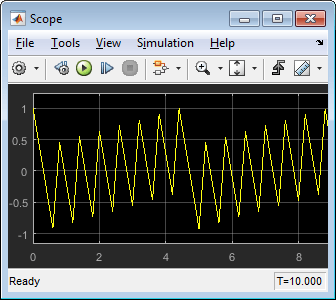 Specify the frequency of the generated waveform. Specify the signal units as Hertz or rad/sec. Select this check box to output a vector of length N if the Constant value parameter evaluates to an N-element row or column vector. When you select this check box, the block outputs a vector of length N if the Constant value parameter evaluates to an N-element row or column vector. For example, the block outputs a matrix of dimension 1-by-N or N-by-1. When you clear this check box, the block does not output a vector of length N if the Constant value parameter evaluates to an N-element row or column vector. Model an inverted pendulum. 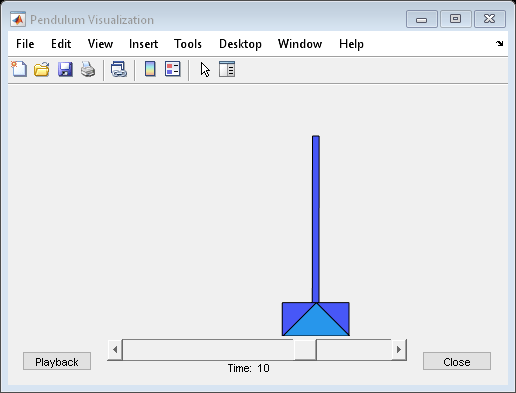 The animation is created using MATLAB® Handle Graphics®. The animation block is a masked S-function. For more information, use the context menu to look under the Animation block's mask and open the S-function for editing. Model flight control for the longitudinal motion of an aircraft. First order linear approximations of the aircraft and actuator behavior are connected to an analog flight control design that uses the pilot's stick pitch command as the set point for the aircraft's pitch attitude and uses aircraft pitch angle and pitch rate to determine commands. A simplified Dryden wind gust model is incorporated to perturb the system. Model a double spring-mass-damper system with a periodically varying forcing function. 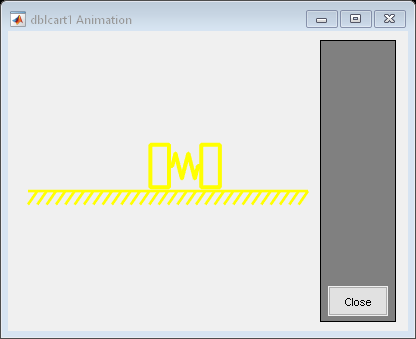 Associated with the example is an animation function that will automatically open a figure window and display to it. In this system, the only sensor is attached to the mass on the left, and the actuator is attached to the mass on the left. State estimation and LQR control are used. Cannot be used inside a triggered subsystem hierarchy. These blocks do not reference absolute time when configured for sample-based operation. In time-based operation, they depend on absolute time.